Della A. Moegenberg, 101, died at her Dekora Springs residence in Saukville on Saturday, April 18, 2009. 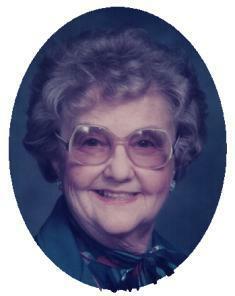 She was born in Port Washington, Wisconsin on June 7, 1907 to Paul and Rose Greiveldinger Russ. She married Alfred Moegenberg of Cedarburg, Wisconsin on September 8, 1928 at St. Mary’s Church in Port Washington. They raised their family on Woodland Avenue in Port Washington. Della also worked for various businesses in Port Washington. She was a proof reader for the Port Herald, a colorist for a local photographer and worked at the former Badger Outerwear, Leider Drugs and Smith Bros. Restaurant to name a few. She never learned how to drive, so she walked to downtown Port Washington from her west side home. Her family attributes her longevity to all the walking she did when she was younger. She was also a talented seamstress. Making clothes for her family, even her future daughter-in-laws wedding dress. She made mink teddy bears too. She also enjoyed baking kuchens. Her husband Alfred preceded her in death July 27, 1982. Della is survived by her loving sons Arthur (Alma) Moegenburg of High Springs, Florida and Roger (Ruth) Moegenberg of Newburg, Wisconsin. Further survived by 8 grandchildren, 13, great grandchildren, 10 great great grandchildren, nieces Gale (Fritz) Philips of Port Washington and Leah Jeanne Shindelman of California, other relatives and friends. Preceded by her husband Alfred, 2 sisters and 1 brother. Rev. Tom Lisjewski will officiate funeral services 7 pm Friday, April 24, 2009 at the funeral home. Interment Immanuel Cemetery, Cedarburg. Visitation 5 – 7 pm Friday at the funeral home.